Heat oven to 400 degrees. Grease 10in. x 1½in. pie plate. Rinse broccoli under running, cold water to thaw. Drain thoroughly. Sprinkle broccoli, chicken, and onion in plate, spread shredded cheese over top. Beat eggs, milk, biscuit mix, seasonings in blender until smooth – 15 seconds on high. Bake until knife inserted in centre comes out clean, 15 – 25 minutes. Top with remaining cheese. Bake just until cheese is melted, 1-2 minutes longer. Cool at least 5 minutes. Makes 6 – 8 servings. Cook onions and oil in skillet over low heat, stirring occasionally, until onions are light brown. Sprinkle tuna, half of the cheese and the onions in the plate. Beat eggs, milk, baking mix, seasonings in the blender until smooth – 15 seconds high. Pour into plate. Bake until knife inserted in centre comes out clean, 25 – 30 minutes. Top with tomato slices and remaining cheese. Bake until cheese is melted, 3 – 5 minutes. Remaining pie can be covered and refrigerated up to 24 hours. To reheat in microwave, place slice on a microwaveable plate. Cover with wax paper or microwave lid. Microwave each slice about 2 minutes on medium power until hot. Let stand about 2 minutes before serving. I’ve just come in from a session in the back yard using my trusty saw. It’s one I chose and bought myself because at 10 pounds I could lift it above my head. This little work horse is a De Walt XRP with an 18 volt rechargeable battery pack. My husband gave me two more batteries and some extra saw blades for Christmas! So much for the implement I was using, why was I, at my advanced age, out there up on a ladder holding such a wicked instrument? I am a logger’s daughter. In our large back yard we have 3 beautiful sequoia trees. When we moved here 21 years ago the smallest one was just the right size to be adorned with lights during the Christmas season. We used an extension ladder to arrange several strings of bright lights plugged into an electrical outlet we installed for the purpose. Today it is impossible to even get near enough to the bottom branches for decoration. The tree is absolutely enormous. Trees grow quickly in the Pacific Northwest. A second tree is a different variety of s sequoia and in its unobtrusive location grows at will. 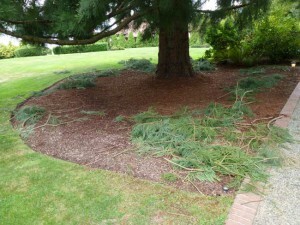 The largest tree has spread wide over the lawn and driveway so that from time to time both my husband and the gardener have complained about the branches hanging down – they scratch them as they ride the lawn mower and get in the way of large delivery trucks. Their answer is to clip off the errant branch so as to be out of the way. The tree has grown quickly where it had been cut and then as a result strangely shaped branches appeared until the tree looked misshapen and unnatural. I like my shrubs and trees to have a natural shape and over time have taken responsibility for trimming everything that needed it, except the hedge. On this occasion I was simply correcting the shape of the tree by cutting the errant branches closer to the trunk, the way they should have been cut in the first place. When you drive into our yard now you will see the view beneath the lowest branches, which incidentally will not drag after a heavy snowfall, and my family and workers will be happy with my result. What Will You Leave to Your Descendants? When I am gone my written stories will be among the other inherited gifts my children and grandchildren, and beyond, will have. Memoir writing is for them, not for the child as much as an inheritance for both, to help a new generation of people understands the choices we made and why. In hindsight I wish so very much that I had paid attention to what my mother spoke about when I was a self-absorbed teenager, and later during the years I was a busy at-home mother of three. She knew some of the stories but not all of the family history I have now discovered through research. I expect it is much the same in many families who make the mistake I did. It was my good fortune to have my sister recording her discussions with our father during his Christmas visit with her one year. Those interviews became the basis for the time line of my book, from Fjord to Floathouse. He told her the years and locations where his father had worked during the early years when he hand-logged on the British Columbia coast before I was born. Thankfully she transcribed their conversations and I still have the tape of his voice talking to her. Measure all dry ingredients into a very large bowl. Store at room temperature in covered container. (i.e. ice cream bucket) Makes about 3 litres mix. This mix recipe containing powdered milk is especially useful on camping or boating trips because the need for fresh milk is replaced by only the addition of water. I always have it on hand at home without the powdered milk to make biscuits, pancakes, impossible pie, roll-ups, even dumplings. I’ve found its simplicity of use saved the day when guests arrive unexpectedly or I’m without needed time to cook rice or potatoes.